In this 4th pAsuram, AzhwAr feeling dejected that “How can I inform to emperumAn who left me even after knowing my nature?”, again out of hope/desire requests some maganRil (a type of ibis) birds “Would you go and tell him about me or not?”. Subsequently, parAnkusa nAyaki wanting to send a messenger to dark-cloudish hued emperumAn, speaks towards beautifully (similarly) colored maganRils (ibises). 4th pAsuram – Previously parAnkusa nAyaki stated “my sins are so much that they cannot be exhausted by enjoying the fruits of the same” in 2nd pAsuram. Did she experience any suffering? Yes – When emperumAn turned his face away from her for a moment – she experienced great suffering (there by exhausting the accumulated sins). At that time, she assumes that some ibises who came near her were asking here “how can he help you?”. She feels dejected and tells them “Even after seeing my pitiful state – he left me. What can I tell him?”. But out of desire, as if telling to some one who does not listen, she says to ibises “will you go and tell him about my situation or not?”. nalguthirO – will you help? nalgIrO – will you not help? While being together, emperumAn have seen my inability to cope with separation by observing my bodily changes during his embrace, etc., and what words can be said to that dark-cloudish hued emperumAn? Still, Oh beautifully blue colored ibises! Can you tell him or not that I cannot sustain myself in separation? Here “avar” is used as parAnkusa nAyaki‘s venerable way of calling emperumAn. In this pAsuram, the beautiful form of the gataka (AchArya) is also highlighted. en nIrmai – my nature, my tender form/heart. kaNdu irangi ithu thagAthu ennAtha – Instead of showing compassion on seeing my suffering, he left. Here a thamizh scholar asks bhattar “Should it not be ‘kEttu irangi‘ (having compassion on hearing my suffering) instead of ‘kaNdu irangi‘ (having compassion on seeing my suffering)?”. bhattar (being an expert in thamizh grammar and literature) replies “When he relaxes the embrace, her body becomes pale out of separation”. The scholar again asks “Is it even possible?”. bhattar asks “Don’t you know thirukkuRaL 1187 ‘pullik kidanthEn‘ and kuRunthogai 399 ‘kAdhalar thoduvuzhi‘? Is that not sufficient reference?” [The scholar’s question is – since parAnkusa nAyaki is singing in separation, emperumAn cannot see her suffering – but only can hear about her suffering. bhattar says that though the current situation is in separation, parAnkusa nAyaki reminds him of the time when they were together when he was observing her suffering in a moment of separation]. en neela mugil vaNNarkku en solli yAn sollugenO – emperumAn was so attached to her that even in separation she says “ennudaiyavan” (mine – owned by me). She says “What can I say to the one who left me?”. When asked “Why are you saying like this?”, parAnkusa nAyaki says “He did not show compassion even after seeing my sufferings. How do I expect him to show compassion on hearing my sufferings now?”. When asked “When did he see your suffering?”, parAnkusa nAyaki replies “While being together, when he takes his hand away from me, that part of my body will become pale out of sufferings in separation”. kaNdirangi – Should he not know that I cannot sustain myself as he seen me losing consciousness as soon as saying “eththiRam” ? ithu – this state of me – even she herself cannot fully express her state (which is beyond words). en neela mugilvaNNarkku – one who has a dark-bluish complexion like a cloud. He showed his beauty and got me to become fully dependent on him. But this radiance is not seen in his heart [comparison with cloud is done for both bodily beauty as well as the generosity of cloud which rains over everywhere – here, parAnkusa nAyaki says, emperumAn has beauty like cloud but does not have the compassion towards her]. AzhwAr himself says in thiruvAimozhi 8.9.5 “yAmudai Ayanthan manam kal” (our cow-herd boy’s heart is made of stone). Initially giving up thinking “if he can leave me even after seeing my suffering, what is the use of sending a message?”, later out of hope/desire, starts sending the messenger again. This is like the behaviour of gOpikAs towards krishNa as explained in srI vishNu purANam 5.24.15 “athavA kim thadhAlAbhai: parA kriyathAm kathA | apyasau mAtharam dhrashtum sakrudhapyAgamishyathi ||” (If there is no use of speaking about him, let other matters be discussed. Would this krishNa not come to visit his mother at least once?) – here the gOpikAs are first saying he does not need us (so won’t talk about him, then out of hope expects his visit saying), but he would need his mother. 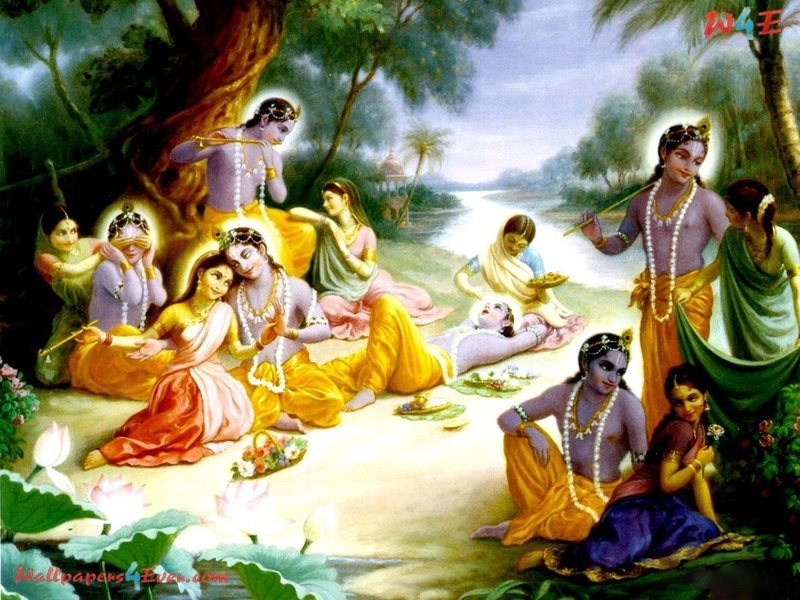 avar kaN thangAthu – My life will only be sustained on/by you (who is my master). nampiLLai explains a similar conversation from srI rAmAyaNam between sIthA pirAtti and hanumAn (who is the messenger from srI rAma). sIthA pirAtti is upset with srI rAma for not rescuing him quickly. At that time hanumAn asks “But, if you are so attached to srI rAma, how have you sustained yourself thus far instead of immediately giving up your life?”. sIthA pirAtti replies as in srI rAmAyaNam sundhara kANdam 36.30 “na chAsya mAthA…“. nampiLLai explains this slOkam – perumAL showed all his love (like towards his father, mother, etc) towards me. While he is searching for me if he finds me dead, he will be heart-broken like a thirsty person finding a broken pot (without water). That is why I sustained myself to protect him. oru vAych chol – Just one word/phrase is sufficient. Like sIthA pirAtti said to hanumAn in srI rAmAyaNam sundhara kANdam 39.10 “…vAchA dharmamavApnuhi” (by conveying the message using the appropriate words to the illustrious srI rAma, so that he can console me while I am surviving, you become virtuous through speech). nanneela maganRilgAL nalguthirO nalgIrO – Both perumAL and yourself have dark-complexion. So, are the actions also similar (both trying to not help me)? Out of sorrow, she asks “will you help or not?”. This entry was posted in thiruvAimozhi, thiruvAimozhi 1st centum on July 18, 2015 by Sarathy Thothathri.